A dog rescued from a Korean meat farm and brought to the Humane Society of Tampa Bay was terrified and huddled in the corner, but when she finally allowed rescuers to come close, they saw why: She is pregnant and due any minute. "Rosa" was completely shut down and beyond frightened, the Humane Society said. "Her body language in the photos shows that she is trying to disappear into the wall," the organization posted on social media. After noticing her belly, a trainer was able to get near her and touch her to confirm her pregnancy. Rosa has been moved to a quiet kennel where she can be safe. 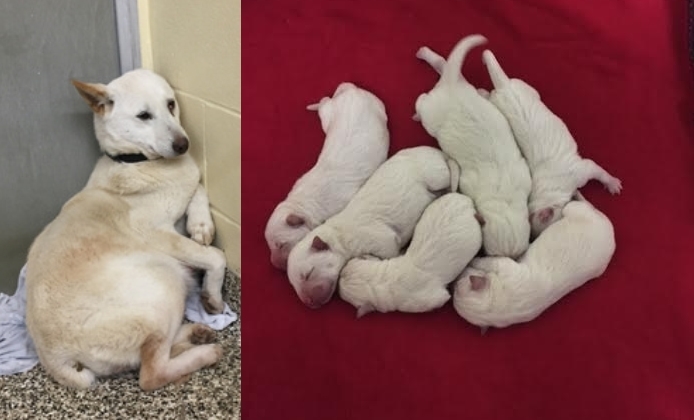 "We are extremely grateful that she is not still stuck in a filthy, crowded cage where she'd give birth alone and that her puppies will now have a fighting chance," the Humane Society said. Rosa is one of about 14 dogs once held at a Korean meat farm and brought to Tampa. The dogs traveled for more than 8,000 miles to get to Tampa, which was a stressful journey. Many were afraid to leave their cages, and one pup, named Harriet, had to be shown how to fall asleep on her fluffy bed by volunteers. The rescued dogs are a variety of breeds and sizes ranging from 115 pounds, down to about 20. The Humane Society said it knows people are curious, so they are allowing them to stop by and take a look at the dogs during open hours, before they go up for adoption. Responses to "Pregnant Dog Saved From Korean Meat Farm"
Thank you - so sad what is happening in this world. This is heartbreaking. Dogs are humans best friends and this evil dog meat business should stop.